Abstract: Secondary oxide/ oxyhydroxide minerals are common in bedrock in a wide variety of geologic settings, where they form as a result of interaction of rocks with relatively oxidizing fluids. In many cases they provide a potential record of interaction of the lithosphere with the atmosphere/hydrosphere over time, posing the potential to understand the timing and conditions of fluid flow along faults and fractures or within basins, the history of near-surface exposure of basement rocks over billion-year timescales, and supergene ore formation. One of the first order challenges in interpreting the record of secondary oxides is a question of timing: when they formed, what their thermal histories were, and in some cases when they were compositionally modified. Most commonly used radioisotopic dating techniques are poorly suited to this because of parent nuclide concentrations that are too low or initial daughter concentrations that are too high (or both) in the minerals of interest, such as hematite, goethite, and various Mn-oxides. The (U-Th)/He system, however, has potential for these applications because of the affinity of oxide minerals for U and Th and low initial He concentrations. In this talk I will review recent progress in (U-Th)/He dating of secondary bedrock-hosted oxides from several settings in the western U.S. and their geologic implications. Examples include Precambrian and Mesozoic hematite in crystalline basement fractures, Cenozoic hematite and Mn-oxides along detachment faults and in supergene oxides, and Plio-Pleistocene ages of diagenetic oxides in sandstones of the Colorado Plateau. While straightforward geologic interpretations are possible in some cases, several examples show that principal challenges for routine application include post-formation U-Th uptake and diffusive He loss. However, in the lemons-to-lemonade tradition of geochronologic development, in many cases these complications pose potential for understanding geologic phenomena besides simple formation ages, including thermal histories and the timing of groundwater interaction in the shallow crust. Bio: Peter Reiners is Professor and Head of the Department of Geosciences at the University of Arizona, where he has been on the faculty since 2006. He is a geochemist and geologist with wide ranging interests in Earth and planetary science, many of them oriented around geochronology and thermochronology, especially using the (U-Th)/He system. He is a Fellow of the Earth System Evolution Program of the Canadian Institute for Advanced Research, and received an EU Marie Curie Fellowship to study at the Centre de Recherches Pétrographiques et Géochimiques (CRPG) in Nancy, France from 2012-2013. He has served as Associate Editor of Geochimica et Cosmochimica Acta, Chemical Geology, and the American Journal of Science. 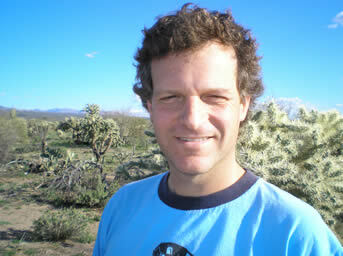 Prior to coming to UA, Peter was on the faculty at Yale University and Washington State University, was the Texaco Postdoctoral Scholar at the California Institute of Technology, and received his PhD and MS in Geological Sciences from the University of Washington, and BS in Geology from Carleton College.